We are Sydney’s leading translation service provider, providing 100% NAATI certified marriage certificate translation services from all languages. Our pricing is fair and affordable with prices starting at just $69.00 for a marriage certificate translation into English, by a NAATI accredited translator of course! Do you translate marriage certificates from all languages into English? Yes we do! Our marriage certificate translation service is available in all languages. Some of the most requested languages include Spanish, Thai, Italian, French, Korean, German, Greek, Indonesian and Portuguese. 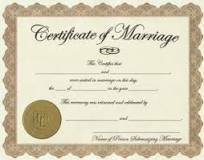 Is your marriage certificate translation “NAATI Certified”? Of course. All marriage certificate translations that we produce are NAATI certified and can be used for official purposes. A NAATI certified translation is one that has been completed by a NAATI translator, which all of our translators are. Can you provide an affidavit with the translation of my marriage certificate? Usually clients that are submitting their marriage certificate to the Family Court for a divorce application will require an affidavit. You will need to seek legal advice regarding your personal circumstances as we are unable to provide you with any legal advice regarding this matter. If you need an affidavit with your translation, simply let us know and we will be happy to organise this for you for an additional fee. How long does it take to translate a marriage certificate? Our Regular marriage certificate translation service is takes between 2-3 business days to complete. We send you the digital copy of the NAATI certified marriage certificate translation for approval before we post out the hard copy. If you also need an affidavit of translation for the marriage certificate, this will take a few days extra because our translator will need to make an appointment with a local Justice of the Peace, lawyer or other authorised signatory before we can send you the hard copy in the mail. Your assistance with the translation of my Thai marriage certificate into English is greatly appreciated. The translation was accurate and at a good price. On behalf of my husband and I, thank you for your professional service. The marriage certificate translation you produced was really promptly delivered and your customer service is great -thanks. Prices for our Regular marriage certificate translation service start at only $69.00 per page. These prices are a guide only and you will need to send through scanned copies of your marriage certificate via our Free Quote Form in order to receive a firm quote for our Sydney marriage certificate translator service. Can I bring my marriage certificate to your office? We are an online-only service so you will need to complete the form on this page in order have your marriage certificate translated into English.